From grocery stores to retail outlets, businesses rely on people being able to get to their store to make ends meet: they require parking lots. One of the biggest natural adversaries to this is the snow and ice that New England Nor’easters bring. With no parking lot and no safe walkways into these stores, these businesses suffer. 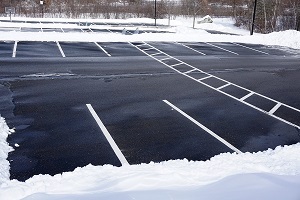 Therefore, it’s vital that before or during a storm these businesses contact a snow and ice management company and get a quote for parking lot plowing. But what factors into that estimate? Let’s look at all the elements to consider. Not all parking lots were created equal, and that’s going to be a major factor in both the time and the cost of clearing a parking lot. There are other factors to consider, including whether you signed up to have your lot cleared on a seasonal contractor or right before the storm. Size: Usually the single biggest factor, the size of your lot will determine the amount of snow needed to be moved and how much time it will take. Layout: Depending on the layout of the lot, it may take additional time and effort due to maneuvering or plowing difficulty of your layout. Obstructions: Obstacles like lampposts, shopping cart stations, signs, and other obstacles will further slow down the process and require additional care. Now if you’re calling up a snow and ice management company as the snow starts to fall, you might have additional factors that come into the contract. Storm Intensity: The amount of snow that’s scheduled to come down may impact the workload and therefore the bottom line. Number of Plowings: Likewise, depending on the snow’s intensity, your lot may require multiple plowings over the course of the day to keep it clear. Another thing to think about is what other parts of your property do you need plowed, snow-blown, or otherwise shoveled for entrance into your store. Also, think about if your walkways or even the entire lot needs sanding and/or salting to provide traction and manage ice buildup. It makes sense to also provide clear walkways and entrances to your storefront. While plows can clear most of it, some of these passages are outside the scope of the lot. It’s important to decide if you want the snow removal company to deal with that as well, or if an employee gets handed the shovel. Remember to think about sidewalks as well to allow pedestrian traffic to your store. An often-overlooked part of the process, do you need to provide access to your employees and vendors and the backend or loading docks so staff and freight can move into and out of the building and do their jobs. Another big cost to consider is what should be what you need to be done with the snow after it is cleared from the lot. While most snow and ice management provide the options of “stacking” or moving the snow into piles on the edges of the lot, others also can physically haul the snow away, though at an additional cost. Make sure to think about what your lot needs, and if it can afford the space the snow will take up and the eyesore it produces. Now that you’ve got more information, are you ready to get a quote for your parking lot? Here at Greener Horizon, we provide full Snow & Ice Management services, including commercial snow removal in southeastern Massachusetts. Contact us today, and we’ll be able to head over to your business for a complimentary consultation about clearing your parking lot and walkways for the entire winter.